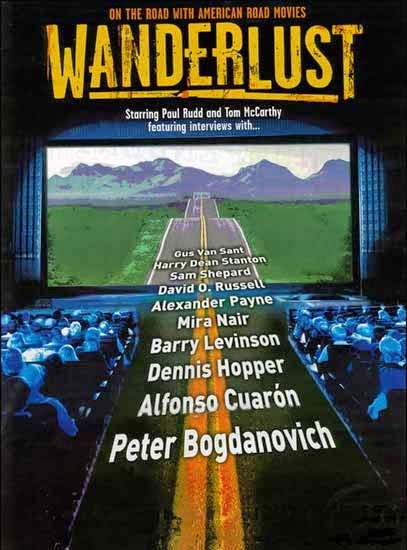 Tag line: "On the Road with American Road Movies"
Produced in 2006 for the Independent Film Channel, Wanderlust is yet another of those documentaries that I love, a cinema-centric motion picture that focuses its attention on a specific aspect of film. In the case of Wanderlust, the topic is the American road movie. From as far back as the 1930s, Hollywood has had a love affair with the vast expanse of the American landscape as seen from the country’s roads and highways. In movies like Frank Capra’s It Happened One Night and Preston Sturges’ Sullivan’s Travels, characters hit the open road, sometimes with hilarious results. But it wasn’t all fun and games; as John Ford’s The Grapes of Wrath showed us, some people had no alternative but to drive, hoping to reach paradise just over the next horizon, yet finding only more heartache, more lost souls seeking the same relief. In the ‘40s and ‘50s, film noir classics such as Detour and Gun Crazy cast a shadow over the American road movie, giving us characters that, instead of searching for something, were on the run, trying to evade both the law and their own turbulent pasts. Then, in the late ‘60s, a revolution took hold of the American film industry, forcing the old guard (the studio system) from its comfortable perch and turning out pictures aimed at a younger audience. Yet even here, the road played an integral part, especially in two of the era’s seminal works: Bonnie and Clyde and Easy Rider. Through the ‘70s (Two-Lane Blacktop, Badlands, Smokey and the Bandit), ‘80s (The Cannonball Run, Paris Texas, Something Wild) and ‘90s (Thelma and Louise, Natural Born Killers, The Straight Story), movies continued to evolve, reflecting the values of each new generation, and through it all, the American road remained as vital as ever. While its presentation of the above material is definitely familiar (talking head interviews, film clips, etc), the topic explored gives Wanderlust an almost epic feel, taking us from one end of this country to the other as it examines the cinema’s fascination with cars and driving, whether feeding a desire for speed (a key component in practically every movie directed by Hal Needham) or a quest to find comfort, both at home (Planes, Trains and Automobiles) and someplace new (Spike Lee’s underrated 1996 film Get on the Bus centers on a group of guys traveling to the Million Man March in Washington D.C.). In addition, the filmmakers include several excerpts lifted from the works of such authors as Jack Kerouac and William S. Burroughs, read by the likes of Matt Dillon, Gary Sinese, and Lily Taylor. Aside from linking the documentary’s segments together, these brief bits of narration also give the movie a mystical quality, as if the road was as much a religion to some as it was a route for transportation. Even if you’ve already seen most of the movies that Wanderlust covers, you haven’t experienced them the way they’re presented here, and odds are, the next time you sit down to watch them, you’ll see these films in an entirely different light.